Written by Patricia Faulk, Teen Leader. Edited by Anna Prince, Teen Leader. 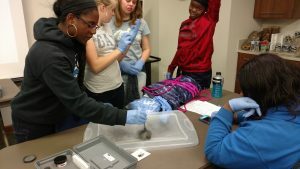 Whip out your detective gear for the latest Open Minds Teen Science Café Whiteville about fingerprinting. 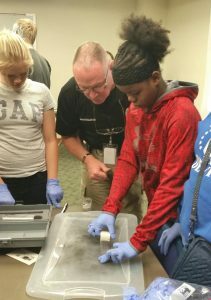 In this café, Police Detective Ron Guyton from the Whiteville Police Department returned to give his second café this season, and lead the teens through an interactive program where participants learned how to identify, collect, and examine fingerprints. Detective Guyton talks to Whiteville teens about the different types of fingerprints. Detective Guyton began the café with a brief Powerpoint which revealed that fingerprints are the most common data collected in crime scenes. In his presentation he also provided the history behind fingerprinting. Fingerprints, in general, can’t change unless a physical intervention occurs, such as burns, scars, or acid. In addition, he taught us that there are three different types of prints: patent, latent, and plastic. Patent prints are fingerprints that are visible to the naked eye. Latent prints require ultraviolet lights, chemicals, or powder to be seen and uncovered. Plastic prints are impressions that are made into soft materials. Detective Guyton touched on the differences and demonstrated each type of print before letting the teens practice capturing latent prints on their own. The room was divided into several tables, and each table received their own professional fingerprint kit. The kits contained a duster, graphite powder, tape, and plain white fingerprint cards. After the teens placed their fingerprints on the desired surface, they dusted the area with powder, which caused their fingerprints to become visible. The teens then lifted the print by placing tape over the desired area before carefully pressing it down and slowly removing it, causing the print to be captured on the tape. Finally the tape was then pressed on a fingerprint card, allowing the teens to examine the aspects that create their one-of-a-kind print. 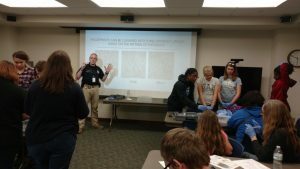 After being trained to collect fingerprint evidence, the teens left the night with new knowledge of the world of CSI and improved detective skills. Are you interested enough to gather and collect your own fingerprints?